I was first introduced to Pupusas by my El Salvadoran friend from college whom I have known for over 10 years now; she’s become one of my closest and dearest friends. We went thought college together and weddings; now, we both have our kids too. I had it for the first time at a Salvadoran restaurant with her and was intrigued at this light, filling and fresh meal. I’ve had tamales many times before and arepas at Street Fairs, empanadas, tacos, but I’ve never heard of Pupusas. The exterior is made from Masa Harina it cornflour (also us d for tamales). It is stuffed with a variety of fillings; beans and cheese, chicken, chicharones , Loroco and cheese , my friend’s husband favorite, Lorocoo with cheese. 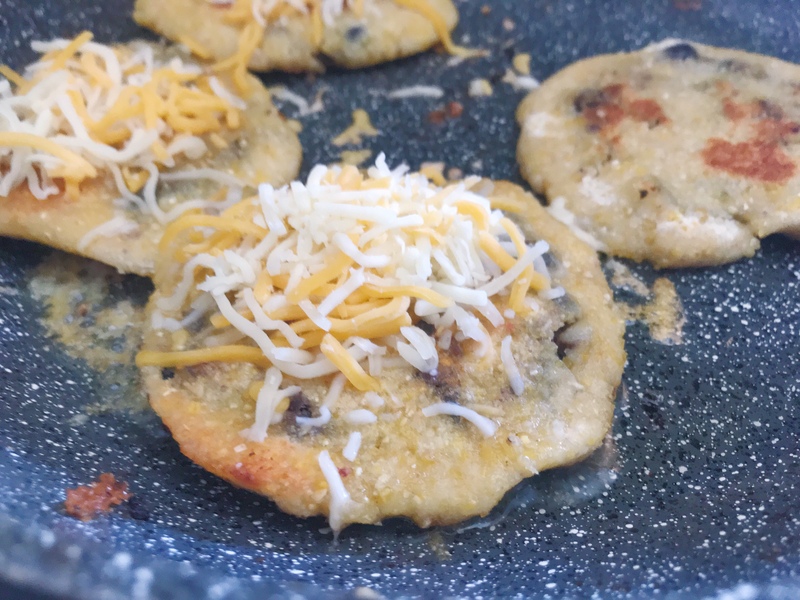 Loroco is a type of flower (taste a little like a milder form of green pepper to me) with cheese; it’s so fragrant and delicate– I feel it lightens up the cheese a little –it’s one I always order whenever I’m having Pupusas. I’ve since had it many times and it has easily became my favorite now too. Pupusas always have a special place in my heart and makes me feel happy– I’ve even had it fresh made from my friends mom, delivered to my house on an occasion. I love it; and I love her. I’m so grateful of having family and friends; they all mean the world to me. They inspire me and fill my heart in so many ways they don’t even know. But more about that another day! I adapted my recipe based on the version I read from Hola Jalepeno and kind of came up with my own version because I didn’t have Masa Harina. I recommend everyone to use just Masa Harina because the combination I used didn’t really taste as good as how it’s originally made. 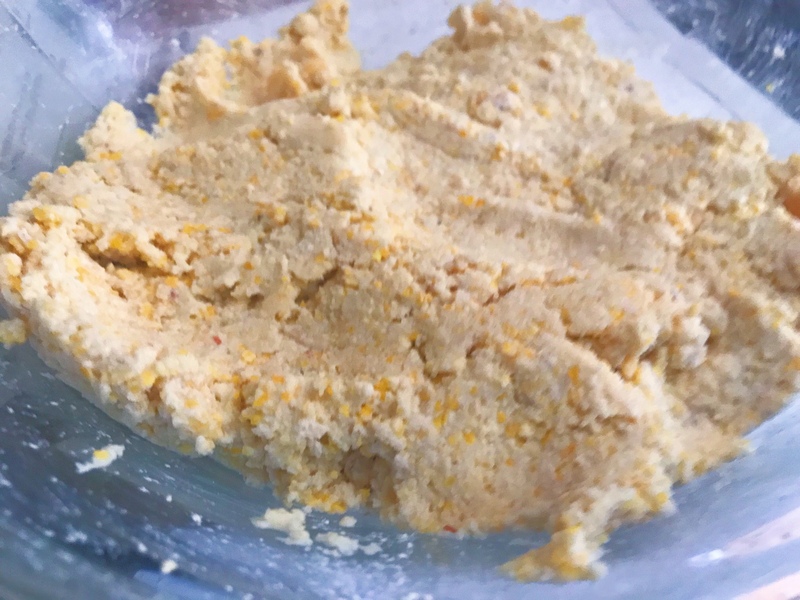 Attempt this recipe when you have time– maybe on a day off and don’t have to rush because there’s lots of components to this dish that makes this, dish, the dish that it is. All the parts are necessary and equally as important to create this little masterpiece. 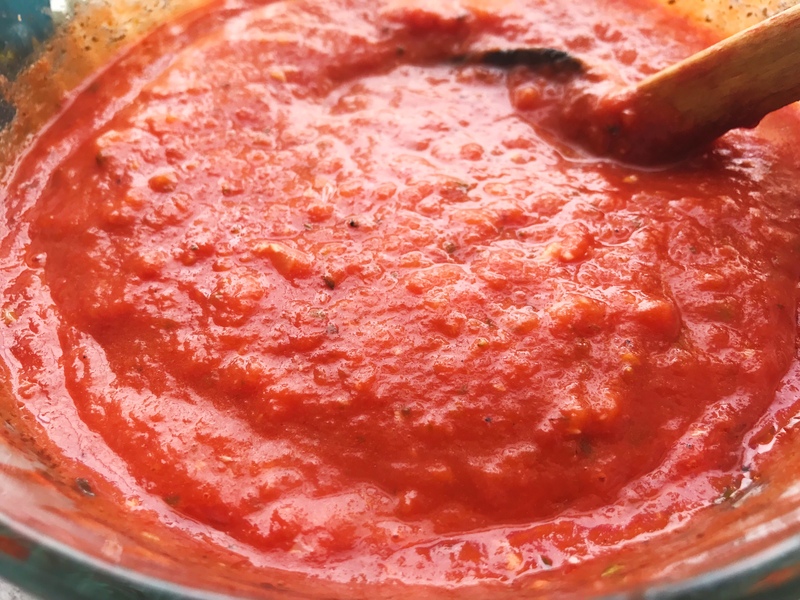 The sauce recipe I followed from International Cuisine; it was easy, simple, but wholesome. The black bean filling recipe I followed Hola Jalepeno as well; this is the one of the plainest recipes I’ve ever made with black beans, but it’s perfect for the filling. Typically the recipe calls for the cheese to be inside with the black bean, but I put mine outside on top of the almost finished Pupusa to melt because Olivia’s allergic to dairy. It turned out great! The filling was too much this time; I think I’ll cut the recipe in half next time-but in our family, we loveee our beans so we will just have it the next day mixed with white rice or with tomatoes, avocados and/or cheese melted on top! I think my friend mentioned that mozzarella cheese is a good cheese to use for the filling, but we have the Mexican blend from Costco and it complimented it well too. 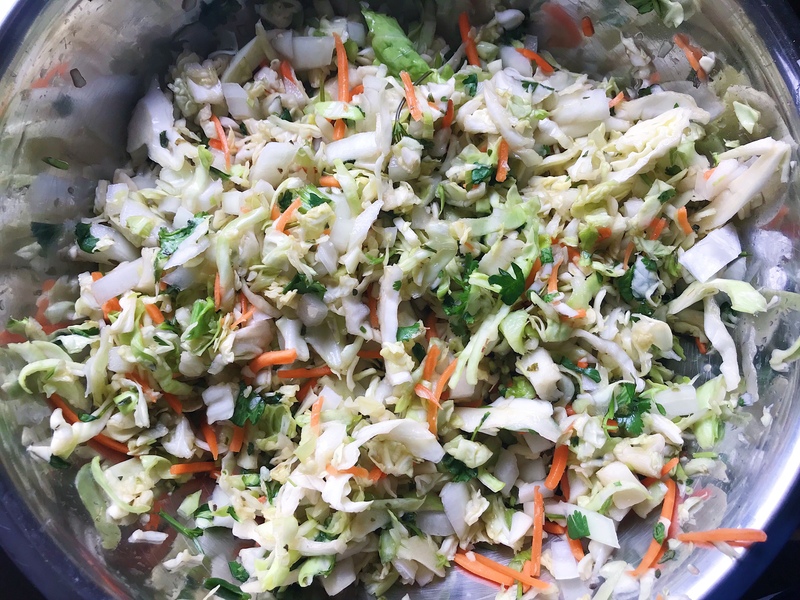 The Curtido (similar to cole slaw ), I adapted from A Cozy Kitchen; this is so yummy! 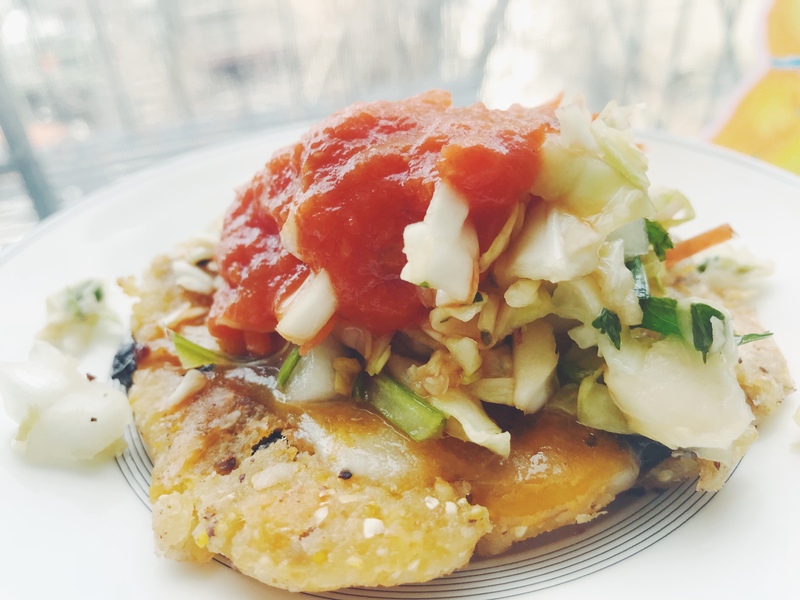 It reminds me of Sauerkraut, but not as tart and has a nice bite that complements the crispy pupusa, humble beans and well rounded tomato sauce. It’s very balanced and it is easy to accidentally eat a bowl full of it! It’s healthy too and not salty at all. I omitted the jalepeno because the girls don’t like it spicy. It really brightens the dish. I made the coleslaw first because I wanted to quickly pickle the cabbage while the everything else was getting prepared. This was the easiest part of the 4 components since it was pre-washed and ready to pickle ! 1-Bring vinegars, salt and sugar to a boil and pour it over the oregeno, cabbage and onion and mix well. 2-Add black pepper to taste. That’s it! Let it sit and wait. I read several recipes and some say two hours and some say 4 hours and others say over night or 2 weeks. My style is always what’s convenient to me at that moment. I pretty much let it sit for an hour room temperature because that’s how long it took to make everything else. 1–Pour 2 tbsp olive oil and stir fry the onion and garlic on low until almost translucent. 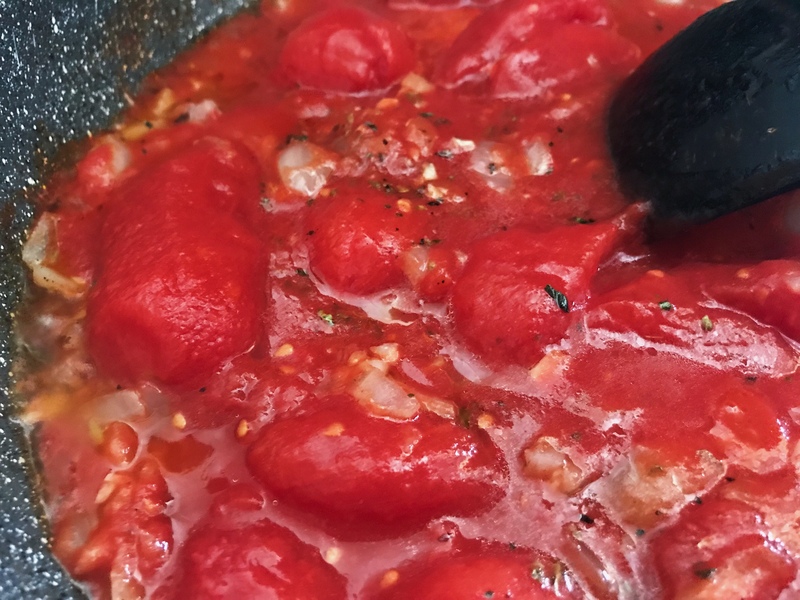 2-Add oregano and tomatoes and boil for 10 minutes, breaking part the tomatoes as you go and giving it a little stir from time to time. Add salt and pepper to taste. Start with a pinch or a few cracks in your grinder. 3- Use an Immersion blender to purée. That’s it! 1-Cook black beans according to instructions. I just cooked mine in 3 inches of water above the beans for about 40 minutes until tender. 2-Pour 2 tbsp olive oil and stir fry the onion and garlic on low until almost translucent. 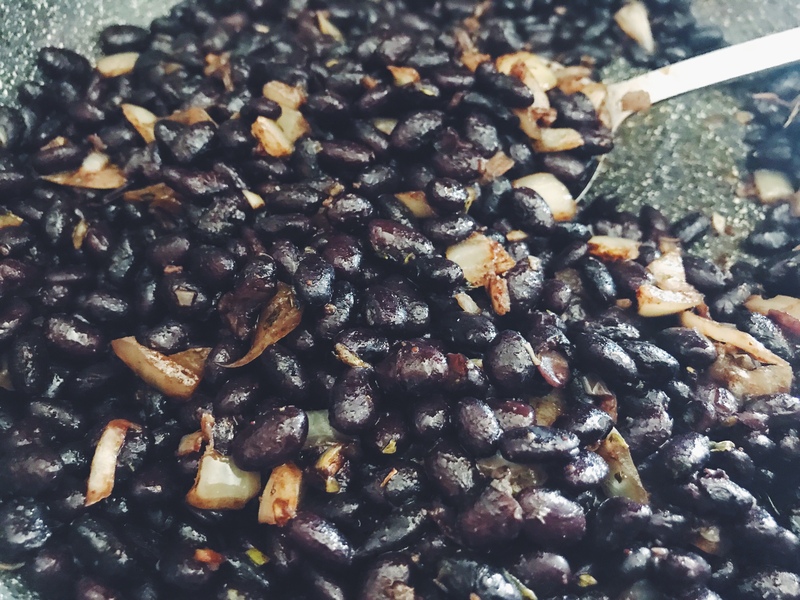 3- Add oregano, salt, chili and black beans and let the aromatics meld and cook for about 3-5 minutes. Then blend it coarsely with immersion blender. I suppose you can mash it with a fork too. 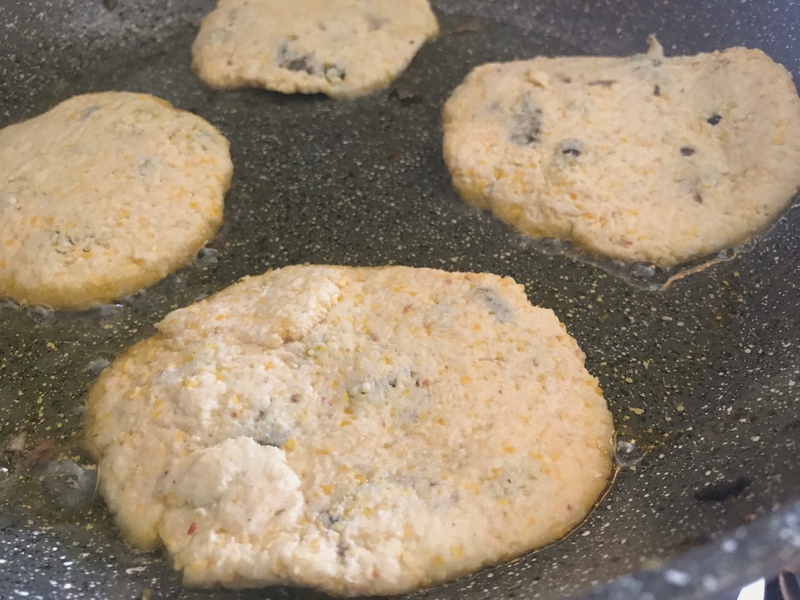 1- Pour warm water over masa Harina and salt and combine well. Add more water if it’s too dry or more masa Harina if it’s too wet. It should feel like very soft play dough when it’s done. 2-Let it sit for 5 minutes. Assembling the Pupusas for pan frying. 1- make a round ball that fits in the palm of your hand. 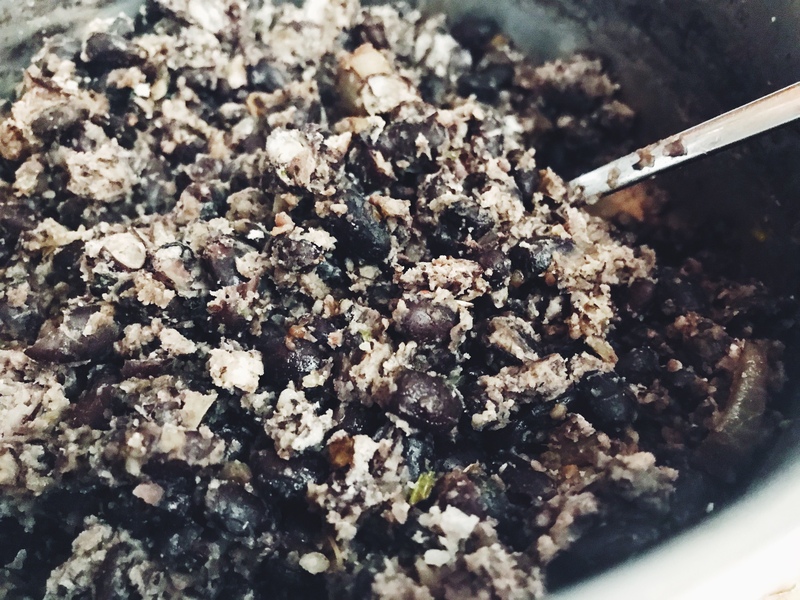 2-Press your thumb in to make an indent and scoop in the black bean filling. 3- close it on top and press down flat. 4- Fry it until it looks toasted on both sides and top with cheese until it melts. 5-Put on plate and too with curtido and tomato sauce! What are some other dishes that you think are underrated or not underrated from your culture? Do share!